Susan Albers promises to unlock the weight-loss power of emotional intelligence. Great! Another diet book, just what we need, right? That’s what I thought at first. If reading diet books would make you thin, I would be wearing a size 2 by now. Reading about what you should and shouldn’t eat very seldom changes the quality and quantity of what you stuff in your mouth. I know that, but I’m still a sucker for diet books. It’s like hitting one more slot machine: maybe, against all odds, this one will pay off. This book is different. There are no food lists or recipes. Not a word about counting calories, or carbs, or fats. It’s not a diet book, it’s a book about decision making. Every time you eat, you make a decision. Remember the hoary old quip about being on a “sea food diet? If I see food, I eat it. So true and so sad. Every time food was available, I chowed down. Before I read Eat Q I thought I was just too weak to resist. Now I know that isn’t true. I have been training myself to PAUSE. Each letter stands for a different mindful action, starting with P for Perceive. Stop for a moment, tune in, perceive and identify this as a moment of decision. Albers teaches real techniques to help you focus on that moment of decision time after time. Techniques that work! The best part is the technique of mindful decision making can be used in every part of your life. Do you really want to plop down in the recliner to watch Wheel of Fortune? Pause, think about it. Decide with your mind, not with your subconscious emotions. Of course, it is early. Eat Q may turn out to be another slot machine that comes up all zeros. But, for the moment, I have high hopes. 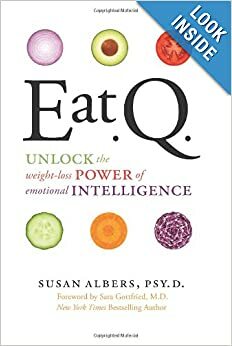 This entry was posted in Book Review, Just my Opinion, Memoir and tagged diet, Eat Q, emotional intelligence, mindful living, Susan Albers, weight loss. Bookmark the permalink. Sounds good. Like you, I’m skeptical of diet books. One never knows, though, this may turn out to be the exception. Thanks for sharing this.